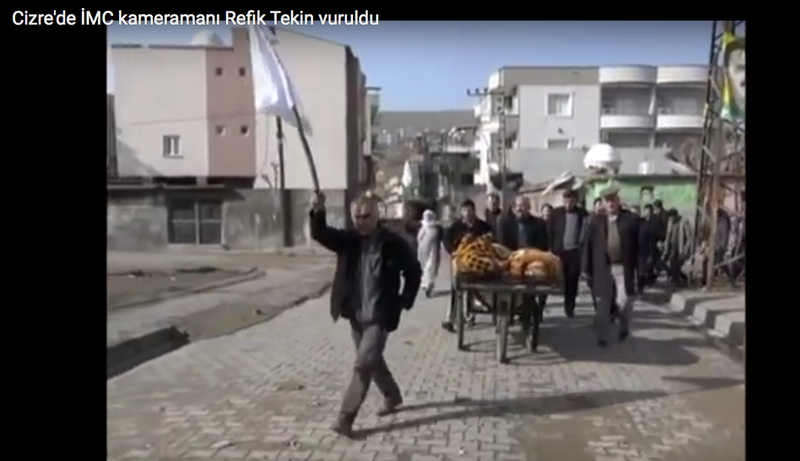 The 25 page report adds to the historical record on behalf of this largely silenced community, additional acts of brutality, murder, disrespect for the rule of law, for democratic aspirations and quite often simple respect for life and limb and the well being of human beings by the Turkish State against its Kurdish citizens. The Report focuses on a number of Kurdish areas, and those in particular where support for the PKK (Kurdistan Workers’ Party) would be the greatest (and thus the violence and damage inflicted likewise at its greatest); the most serious incidents that caused the greatest number of deaths were reported in Cizre (province of Şırnak), but other serious incidents that caused deaths and destruction were also reported in Sur, Silvan and Lice (province of Diyarbakır), Nusaybin, Dargeçit (province of Mardin), Şırnak Centre, Silopi, Idil (province of Şırnak), and Yüksekova (province of Hakkâri). 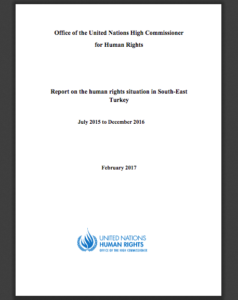 The Report covers 10 areas and in each area finds grounds for serious concern at the behavior of the Turkish State, its president Recep Tayyip Erdoğan and its military apparatus, all of whom, despite responsibility for countless acts of human rights abuses, remain a key ally of western powers as well as a member of NATO. An estimated 2,000 people were killed between July 2015 and December 2016: “in the context of security operations…” This includes military personnel as well as the estimated 189 civilians trapped and burned to death in the Basements in Cizre, a so-far uninvestigated massacre that the people of Cizre are still waiting on the world to recognise and to demand that those who perpetrated it at least be brought before a war crimes tribunal. From the “excessive use of force (such as shelling densely populated areas with heavy artillery and tanks)” what would you expect? This also led to the displacement of up to 500,00 Kurdish people, many of whom, it appears now, the Turkish authorities have no plans for their return with all that implies for the life of the communities affected. For those sensitive to conspiracy theories or false allegations against the Turkish state: the shelling of the Sur neighbourhoods in Diyarbakir show that: “Diyarbakır’s 2,000 year-old city walls surrounding the Sur district are a UNESCO-protected site of World Heritage. Municipal reports indicate that during the period of shelling of the Sur district, between September 2015 and May 2016, the Government took measures not to damage the city walls while systematically demolishing entire neighbourhoods within the area surrounded by the walls. This illustrates the systematic nature of destruction of private properties“. Likewise from its own strategic interests: “According to human rights organizations from South-East Turkey, the Government has conditioned financial compensation for destroyed housing upon the signature of a declaration by owners that their property was destroyed by “terrorist activities”. “The curfews, which the authorities reportedly imposed on over 30 towns and neighbourhoods, prohibited any movement without permission, for extended periods of time lasting up to several months. During the curfews, authorities reportedly cut off water, electricity and food supplies to entire cities for prolonged periods of time. Local residents report that even with permission, movement was very difficult, including to access health facilities for the sick and wounded..” Add to this: attacks on medical facilities and personnel, punishment of medical personnel for attending patients, as well as the use of medical facilities for military or security purposes…. This section also includes the “failure to address violence against women” in particular noting that centres for the protection of women’s were closed down in Cizre and Silvan and across South-East Turkey, with the attendant loss of protection for those in need. Likewise in relation to the right to form and join in associations the Report tells us that many NGOs have reported an environment of fear and intimidation now in relation to their work. 9 In relation to deprivation of liberty, fully respect the provisions of the article of the International Covenant on Civil and Political Rights. To the extent that Turkey derogates from this provision, following its notification of July 2016, any measures taken in that respect should not exceed those strictly required by the exigencies of the situation in accordance with article 4 of the Covenant. As do the people in this brutalised part of the globe that the rest of the world largely ignores. But the lesson of human history shows: there can be no alternative to a peaceful democratic solution that respects the rights and needs of all parties to live as part of a vibrant and democratic community.